These points were taken directly from the IMI Core Values and reading the response was a great reminder of who we are as a company: we see every person as a human being before anything else. Because we serve nonprofit organizations, our staff works daily to support people who are making the world a better place. Usually this means management support, but earlier last month, it took on a different meaning. 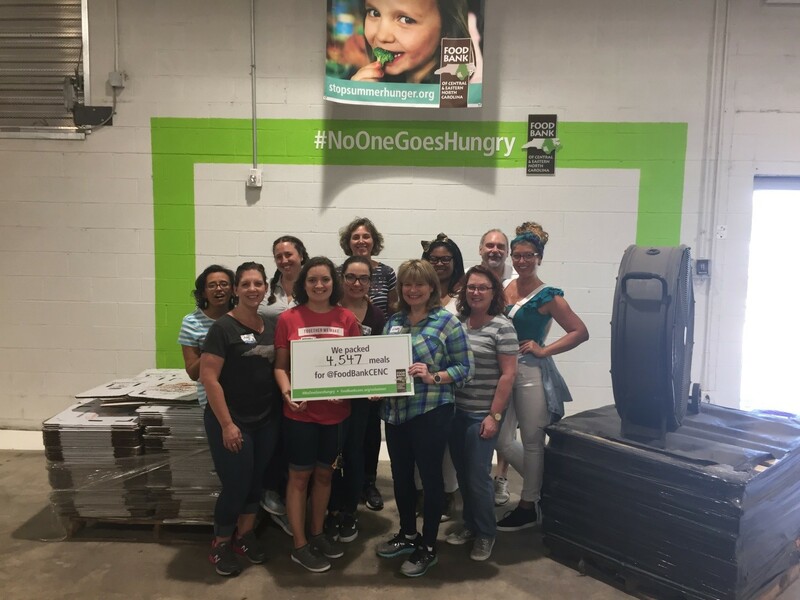 On Wednesday, August 8, the Fun Committee organized a group of 12 IMI Staff to go to the Food Bank of Central and Eastern North Carolina for a two-hour volunteer shift. The Food Bank serves 34 counties which are divided into six regions. 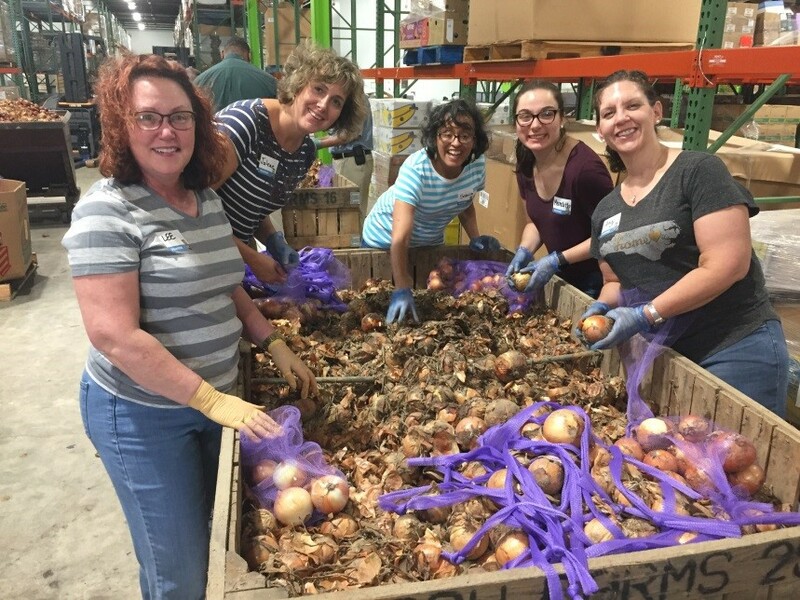 We volunteered at the Raleigh Region Distribution Center, which covers the counties where our staff works and lives. According to a report released by the Food Bank in 2017, 15.1 percent, or 265,360 people, of the population in the counties served by the Raleigh Branch is food insecure. This translates to one or two people in a group of 10 struggling with food security. 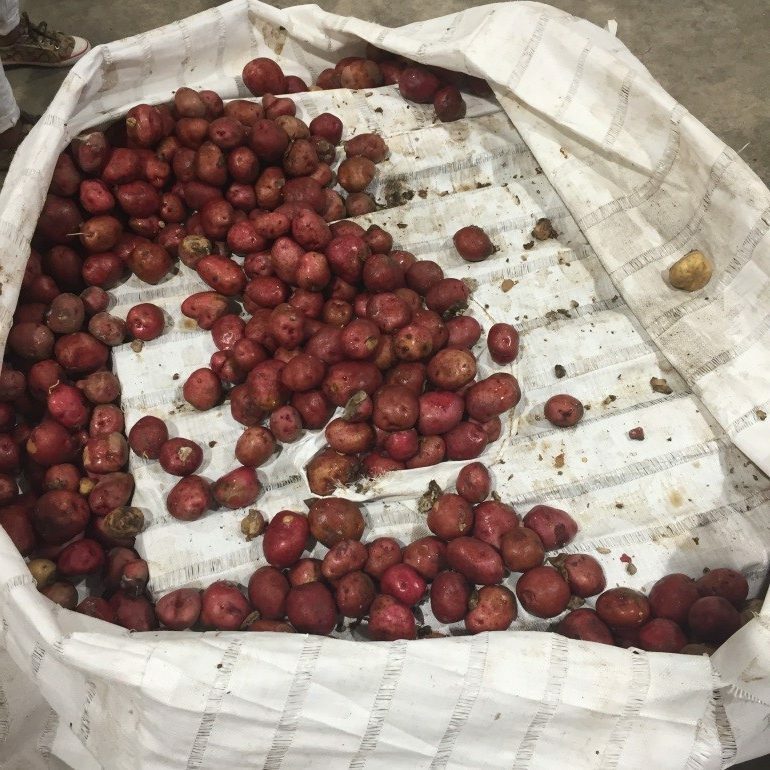 Our task was to sort through one-ton pallets of onions and potatoes and determine whether the vegetables were safe to eat. 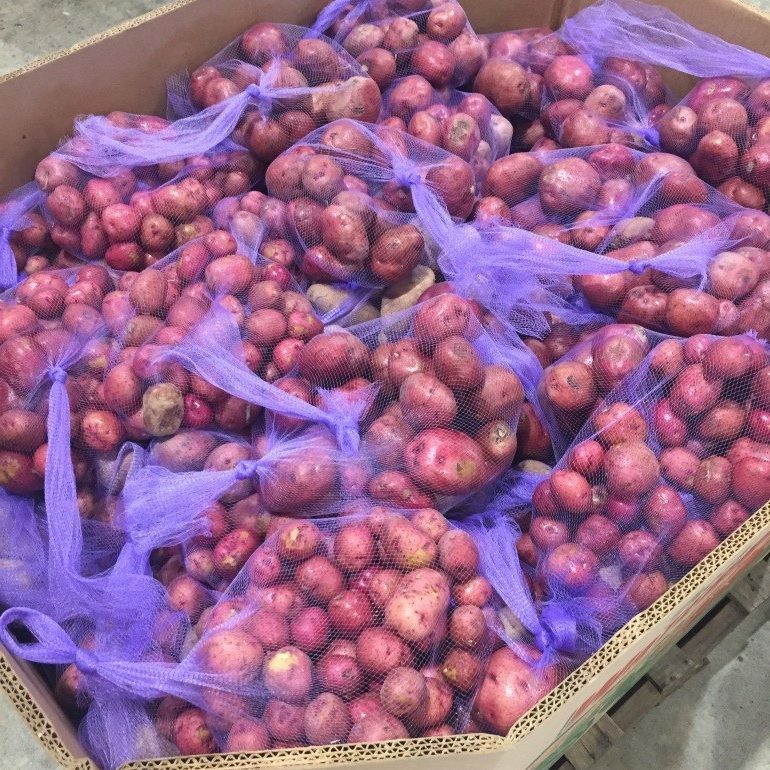 Safe vegetables were bagged for distribution to hungry families across our state while unsafe vegetables were thrown away. Within the IMI Staff group of 12, we broke into smaller groups of four. My group dug into our pallet, which contained onions that were caked in dirt and, in some cases, spotted with green, fuzzy mold. This task was completely outside of the skillsets we use in the office, and we were truly humbled by our experience. The food we were sorting had come straight from the farm and looked nothing like what we see at the grocery store. We were struck by the difficulty of making food safe, evidenced by the dirt speckling our clothes and hiding under our nails at the end of our shift. It was definitely a challenge, but it was rewarding to make sure people in our community were receiving the best food. In addition, through this experience, we grew closer as a team. 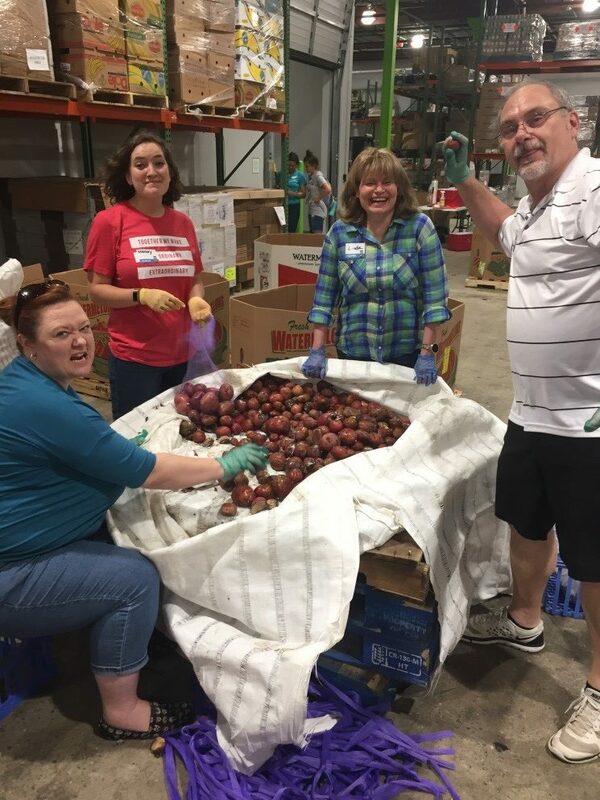 During the time spent together, we talked through how to discern that produce was safe; made runs to the dumpster to throw away unsafe food or to grab more net bags; and recounted stories around the giant pallets. Our group was fueled by our seamless, cheerful collaboration, especially because we were outside of our typical context. 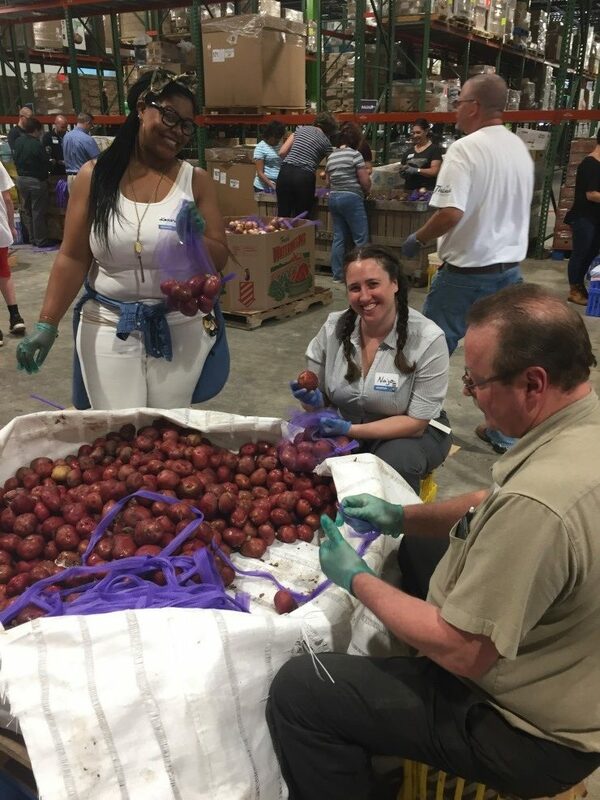 After our two-hour shift, we felt fulfilled when we look at the “fruits” of our labor and realized that we had helped sort 5,400 pounds of fresh produce, which will provide 4,547 meals to our community. 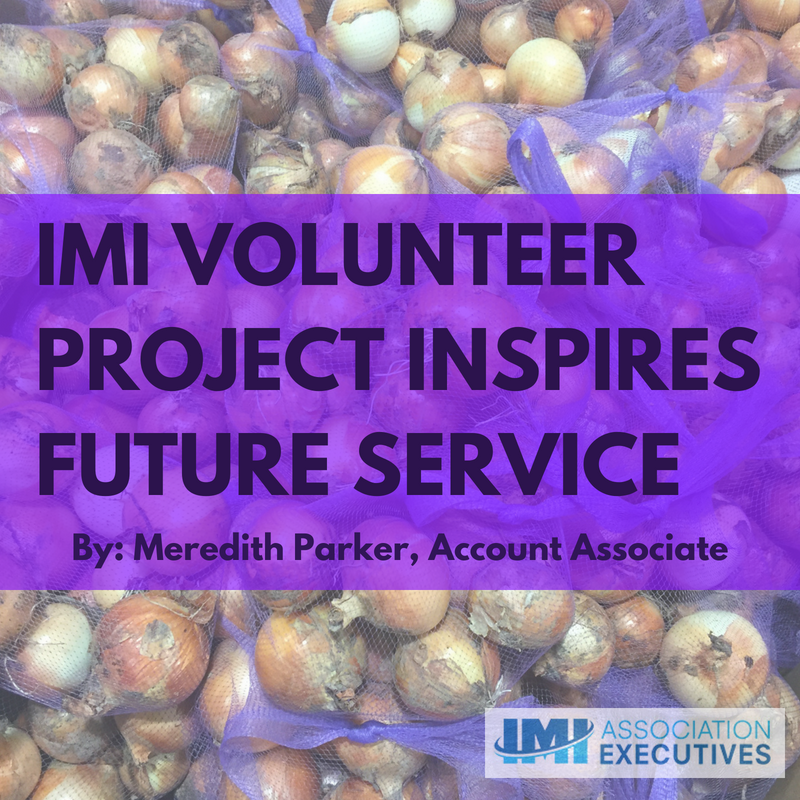 Humbled, Fulfilled, and fueled by our Collaboration, we agreed that we would like for IMI to contribute to our community through regular volunteer service. Last week, we established an IMI Service Committee so our staff can continue to live out IMI’s Core Values in our community. Reflecting on the past few weeks, I am grateful for my colleagues, people who work daily to serve others and still desire to do more. Want to team up with IMI to complete service in the Triangle? Comment below or email me at meredith@imiae.com. In a previous post, I discussed how IMI wanted to start a new charity program and the process I followed to develop a program for our team. Here’s an update on the second and third quarter collections. For our second quarter project, we collected donations for someone in our office who was experiencing hardship. We purchased a large basket and filled it with all kinds of goodies, like gift cards and other items this person needed. She was thrilled with the outpouring and we were all happy to do it. These kinds of collections can be tough to coordinate but are just as important as the bigger charity programs already out there. We at IMI are proud to say that we will help our employees and their families when we can. During our third quarter we chose to collect donations for the SPCA of Wake County. The SPCA of Wake County, located in Raleigh, N.C., was founded in 1967, and has rehomed thousands of animals during that time. Their mission statement is: “To protect, shelter, and promote the adoption of homeless animals; to provide education about responsible pet ownership and to reduce pet overpopulation through spay/neuter programs.” The organization operates solely on donations, and does not receive government funding. For more information, visit the SPCA of Wake County website. For this charity effort, I built a custom website at a third-party website called Razoo.com. Razoo.com allows you to set up a website to collect donations for a small fee. They are connected with thousands of charities and can even help to set up a new fundraiser. We collected donations in August and September for a total of $225. Now, I am gearing up for our fourth quarter charity project, which will be to collect donations for Backpack Buddies, a program coordinated by the Inter-Faith Food Shuttle, located in Raleigh. This collection will be our final community service project for the year. In 2014, IMI collected donations for the American Heart Association for Women, a co-worker, the SPCA of Wake County, and Backpack Buddies of Raleigh. I am proud of what our group was able to accomplish. We plan to do something similar next year with different charities. I urge you to set up a collection in your office, even if it is just placing a tip jar in an office common room or organizing a group to participate in a marathon. Every little bit helps, and brings happiness to those in need.